One of the areas of my life I am focusing on seeking truth is my eating habits. 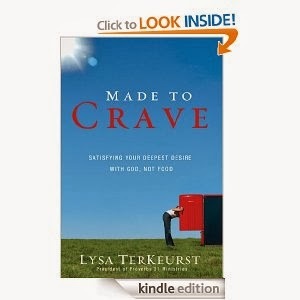 As I said before I recently finished reading Made to Crave by Lysa TerKeurst. In the book she talks about how making healthy food choices is not a matter of will power, but a spiritual matter - one that with much prayer will bring us closer to God. She says something like "I'm not on a diet - I have made a choice to grow closer to God by following Him in this journey of healthy eating." I totally get that. Because, let's face it - it's glaringly obvious that I cannot do this on my own! I am excited that this is not only a journey to lose weight and become healthier, but to learn more about God and grow closer to Him every day. - I don't like grocery shopping. I've been 4 times in the last 8 days. Clearly I need to work on my strategy there! - I don't really like many healthy foods. I am trying to follow the Daniel Plan (Click the link to read more about that) and there are a lot of vegetables in it - not my fave. Thankfully though, I have found some pretty good recipes that I have enjoyed. - I don't enjoy cooking. The prep, the cleanup, etc. - Just not fun. -Planning ahead is not one of my strengths, so I'm working on being better there. - I didn't eat out once last week (Mon.-Fri.) - I couldn't tell you how long it's been since that happened! 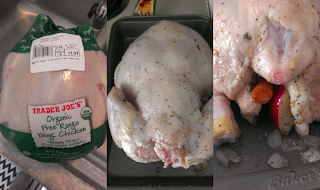 I did eat out all three meals on Saturday, but made healthy choices, so I count that a success, too. - I bought some organic stuff. I know that's better for me, but I usually go the cheaper route. I don't do meat on the bone - it's gross...but I baked this little bird and pulled all the meat off to have this week. And I must say that chicken on my salad earlier in the week was GOOOD! - I have lost some weight - I'm not exactly sure how much because I weighed at the doctor's office last week and then on my scale this week. I'm OK with not knowing, though - while the scale is indication that I've been making good choices, it's not the main thing. Perhaps my biggest triumph this week is that I feel good about my choices this week. I have trusted the Lord that I can do this - and it is only through His guidance that I have started this journey on a good note.